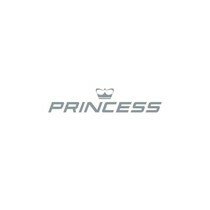 Princess welcomes you to a world of sophistication and elegance. Since the launch of its first vessel in 1956 Princess has consistently evolved to what is now a leading position within the yacht industry. Fusing cutting-edge technology and elegant design, they set the benchmark in quality. Today we’re going to explore the most celebrated yacht of its generation: the Princess V39, an international award winner! Starting with the deck, we find a teak laid transom platform with a flybridge stairway and stairs to the side decks. In terms of storage, we find a self-stowing 25kg (55lbs) delta anchor with 40m of chain, a reversible anchor winch with foredeck, helm position and flybridge controls for better and more comfortable captain’s control. It also includes stainless-steel cleats, fairleads, handrails, and a dual station remote control searchlight to make your cruising easier and safer. One of the best areas of this amazing motorboat is its cockpit. 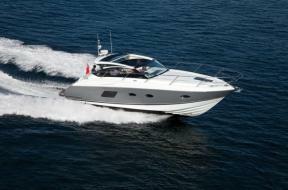 With upholstered seating, a comfortable teak table, a locker housing 240v shore support inlet, a transom fate leading to the bathing platform (with optional electro-hydraulic raise/lower mechanism) and dinghy shock system. It also features the liferaft storage locker and, of course, the cockpit cover. As we get to the Helm Station we understand what makes this boat so amazing. 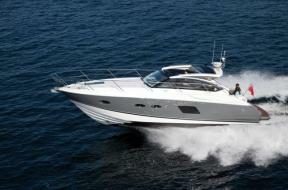 With twin helm seats with for and aft adjustment, Princess makes sure you’re comfortable when cruising this motorboat. 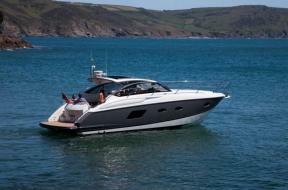 It features full engine instrumentation which includes fuel gauges, exhaust temperature and engine warning system, a rudder position indicator, a full navigation system including VHF/RT, speed and distance log, echo sounder with alarm, autopilot and high speed magnetic compass, controls (with indicators) for bow thruster, windscreen wipers, bilge pump, trim tabs and a chart table with light and chart stowage. In terms of safety, this space includes a 12V outlet to plug in your devices, red night lighting, 24V and 220V electrical control panels and an electric opening window. The flybridge features another dual station instrumentation, controls and alarm system including VHF/RT, speed and distance log, echo sounder with alarm and autopilot ,a large upholstered seating area with a teak table, a sunbed convertible L-shaped seat, loudspeakers linked to the main saloon stereo, an amazing and comfortable wet bar including sink, storage and optional barbecue area, and a refrigerated top loading cooler box to store your catch! Another space we love is the Main Saloon with a stainless-steel framed sliding door to the cockpit and another to the Galley; this space is comfortable and luxurious. In terms of comfort, it features a U-shaped sofa with a dining table, two stools, and a two-seater sofa to starboard (with optional TV). 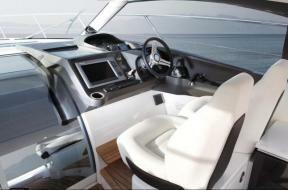 For entertainment, it includes a stereo radio and iPod/MP3, with speakers all around the boat. It also includes an electric drop window to port (as well as the Helm Stations) and sideboard units with drink refrigerators. Next to the main saloon we find the Galley which has a combined microwave/conventional oven with grill, stainless-steel sink with monobloc mixer tap, a refrigerator with freezer compartment, a chopping board, provision for dishwasher and storage lockers and drawers. The Owner’s Cabin features a large double bed with drawers below, a wardrobe with shelves, a dressing table, one sofa and an en-suite Head. 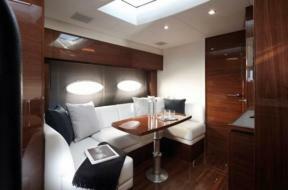 It includes overhead and individual berth lights as well as a stereo with MP3 capabilities. The Guest Cabin has a large double bed with drawers below, a vanity unit, a wardrobe with shelves, storage lockers, and drawers. Overhead and individual berth lights and a deck hatch with fly screen and blind cam also be found. 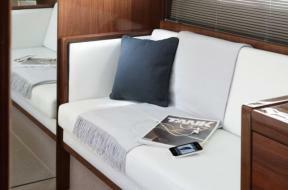 Both cabins feature 220/240V power points and pocket sprung mattresses. Both Heads feature opening portholes and full electric shower stalls. All the interior furniture can be chosen in Serotina Cherry or Light Oak with satin or high gloss finish. American Walnut or Rovere Oak are also available as options. 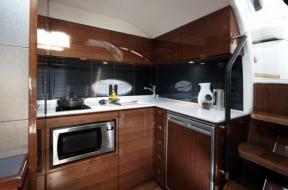 It features avonite worktops and tiled floors in all bathrooms and avonite worktop and timber-laid floor in the galley. You can choose between a high-quality carpet and upholstery fabric from an extensive range. 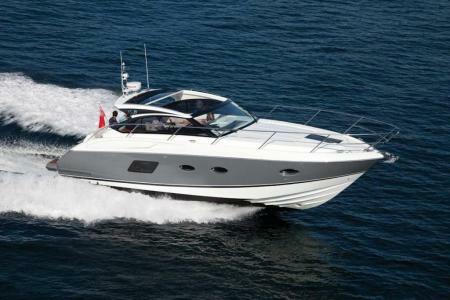 This Princess V39 is powered by two Twin Volvo D11-670 or you can choose from these optional engines: Twin Caterpillar C12 A (2 x 715mhp) Twin Volvo D11-725 (2 x 725mhp). It has a L.O.A. of 42ft 6in (12.98m) a beam of 12ft 5in (3.81m)/ 5.23 M and a draft of 1ft 10in (0.56m). Its fuel capacity is 160 gal/192 US gal/730l and its water capacity is 73 gal/88 US gal/332l. 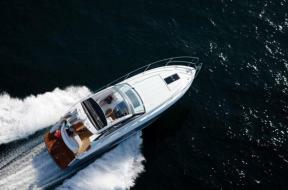 · Remarkable handling and maneuverability from our latest variable-geometry hull. 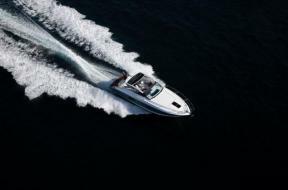 · Effortless power with a top speed of up to 32 knots. 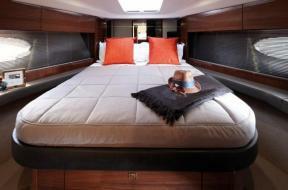 · The finest master stateroom on a boat of this size. 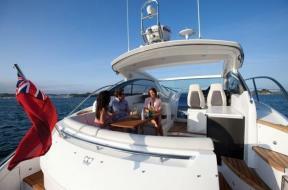 · Galley aft layout for superb on-deck dining. 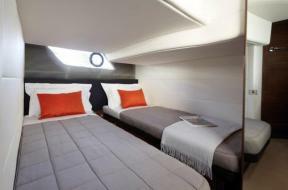 · Three cabins plus an optional crew or child’s cabin. Now you’ve read this review, come and join us on the virtual tour, where you can see each space yourself and decide if this is the yacht for you!